This super large 14"x11" hardbound book weighing about 6 pounds is a recent favorite at home. Turn to any random page and read it like an encyclopedia - the evolution and origins of sea shells, the animals inside the shells, shell architecture, genetic designs of color and pattern, conchology and all about Shells and Man. The photographs are beautiful, whether they are an imposing double-page spread, a stunning full-page close-up, or just a small insert. It feels like a trip to the art gallery just looking at the pictures in this book. 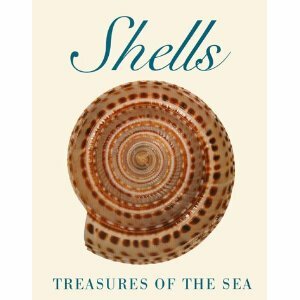 Many shells from my childhood, shells that I collected just for the joy of it not knowing the creatures that were part of it or what they were called, came up in this book, stirring not just nostalgia but a renewed curiosity about them. From stylish Coronate Pagoda Spindle, Common Turritella, Cypraeidae (Cowrie) shells ('Chozhi', in Tamil - pieces in a favorite game my mom and I used to play), Chambered Nautilus, Murex, gorgeous Green Abalone, to regular everyday Clams, Mussels, and Limpets, the book itself is a treasure for sea shell lovers. Many of the soft invertebrate mollusks that can be traced back to over 600 million years ago have evolved to secrete a protective calcium carbonate shell which is what we see and love and collect as beautiful sea shells. The resident 7-year old has reached for it consistently over the last few weeks, especially after a full day at school, just laying on the sofa and leafing through its pages picking up random tidbits of information, indicating how absorbing this huge nonfiction volume can be.